In this before and after, you are going to see how braces are used to straighten crowded top teeth. The pictures below are from one of Dr. Viechnicki’s actual patients with crowding of the top teeth. There are 3 very crowded top teeth (arrows). 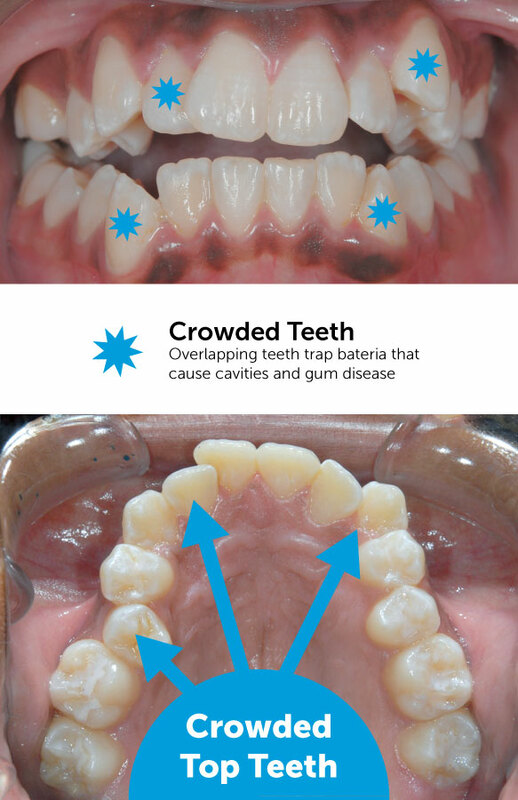 The crowding causes the teeth to overlap, which will trap bacteria that causes cavities and gum disease. The two most common problems caused by crowded top teeth are a (1) lack of confidence when smiling and (2) damage to the teeth and gums. 1. Crowded teeth look crooked: Crooked teeth can make people self-conscious about smiling. The overlapping teeth can make certain teeth stick out while other teeth are trapped back. Some crowded teeth won't even come into the mouth on their own. 2. Damage to the teeth and gums: And there are health reasons for why crooked teeth need to be straightened. The most important reason to get crowded teeth straightened is to protect the health of the teeth from harmful bacteria. When teeth overlap, food, plaque and bacteria can get trapped between teeth. That means that over time, the trapped bacteria will cause cavities and gum disease. Teeth can rot because of cavities or become loose because of periodontal pockets and periodontal disease. The best way to treat crowding is with braces. In the animation below, a braces patient had back teeth removed in order to make space for the other teeth to straighten. Animation of crowded top teeth straightened with braces. First, back teeth are removed to make space for the rest of the teeth to straighten. Then, teeth are moved with braces to align the teeth. Braces straightened all the crowded teeth. In summary, crowding is a problem that needs to be treated. 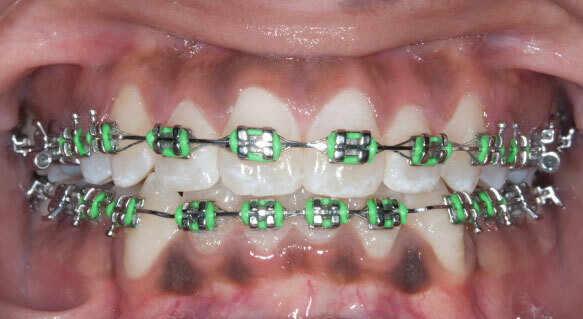 Braces can straighten crowded teeth to improve both function and esthetics.